I've spent the past two weeks working on the Summer 2018 issue of Cast On. I've uploaded all of the patterns and articles to the platform but it won't go live until I add the photographs. The photographer had a family health emergency but she hopes to get them to me this weekend. All of the hard work is done. Just a reminder...when you send your lessons make sure they can be tracked. Not only can you track priority packages, tracking is free for first class packages as well if you take them to the post office. If you don't track them, we will have no way of finding it. I've had very good luck with tracking lately. I always track every package I send. The final project for the Finishing Class is to knit a sweater and finish it. I provide a pattern for a doll sweater which doesn't require much knitting which most students use. 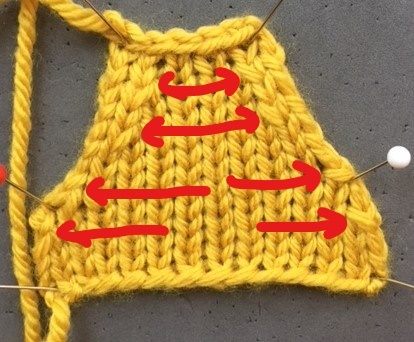 I've noticed that a few students have problems picking up stitches along the neckline since they did not place the decreases properly. I do emphasize where to place increases and decreases in the Reference materials but somehow it gets missed in the final project. Anyone who has ever sewn knows that patterns always add 5/8" for the seam allowance. Knitting requires the same thing if the project will be seamed or has any type of band. That is what the selvedge stitches are for. You use the horizontal bars between the selvedge stitch and the next stitch in for the seam. You use the spaces between the horizontal bars to pick up stitches for bands. If you work a decrease or increase in the first or last stitch, you've just made proper finishing impossible. I blame patterns. Most say something like "Dec 1 at beg of next 4 rows." Unless you know better you would assume this means "beg" means just that, not 1 or 2 stitches in. The majority of students who take the finishing class say they are taking it since they hate finishing. If you don't know what you are doing and you get poor results, you will definitely hate doing it. If you are seaming the inside of a sleeve where you have placed increases in the first stitches, the seam will be ugly but who is going to notice? If you screw up the neckline you will never want to wear the sweater. Every time you look in the mirror you will be reminded that you don't know how to finish. Increases--If you are using M1 increases you don't need to worry. It is impossible to work them in the first stitch. You have to use the horizontal bar between the selvedge stitch and the next stitch. Lifted increases don't really work either. When you try to work a right slanting increase in the selvedge stitch it just slips off the needle. 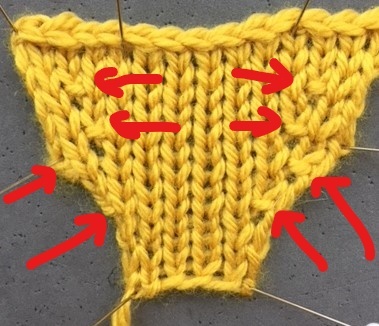 Yes, you can work a left slanting increase at the right side and a right slanting increase at the left side but it is unlikely that a novice knitter would choose these increases. The increase that most novice knitters would pick is the Bar or kfb increase. If you look at the photo, look at the bottom two increases. The ones on the right side sort of blend in but the ones on the left just make the selvedge edge bumpy. (By the way, if a project isn't going to be seamed, yes, you can use this increase at the beginning of a row. I've seen lots of shawls do just this.) I just used bar increases to make the leaves on the First Saturday dresses. I found that at the left side, if I didn't want an ugly edge, I had to work the bar increase in the stitch before the selvedge. The increases at the top are worked with one stitch before and after the selvedge. This provides a seam allowance. Decreases--This is the one that causes problems in necklines. In the photograph below the decreases at the bottom are worked in the selvedges. There is no way to seam the edges or pick up stitches. It will just look awful unless the yarn is really dark, heathered or tweedy. The decreases at the top are worked so that the edge can be properly finished. Again, this applies only to garments where the edge will be finished. Here is a link to the video: Placing Increases and Decreases. I have had very little time to knit. Putting Cast On together requires a lot of time. I am using the pink Savannah yarn left over from the roses for the First Saturday dresses to make a pair of socks. By the way, next Saturday is the First Saturday, Derby Day. I did spend some time charting a design for a sweater for the Fall 2018 issue. The name will be Blackbird Singing and I'll be using RedFish yarns. Elff is working on the colors. I'm thinking of doing a baby sweater with a Bavarian design. I did a sweater as a baby gift 10 years ago. I never wrote a pattern for it. I'll do something similar. Here is the link to the Ravelry project: Franklin's Sweater. Last week was the DFW Fiber Fest in Dallas. We held a Masters Day which was quite successful. The meeting is a very nice one and the market is curated...no drek. Unfortunately I had a bad cold so I wasn't able to have as much fun as I would have liked--maybe next year. I've received a few lessons but things have slowed down. Keep the lessons coming! This tip is prompted by things I've encountered in my projects for Cast On. I checked the index for my blog to remind myself how to work the CDD (S2 k1 psso) decrease on the purlside for the leaves for the dresses (see photos below) and I discovered I had not included it with the other purlside decreases I'd done before. Also, I'm writing the Learn Something New article for the Summer Cast On which is about working single-row stripes while working flat without all of the yarn tails. This technique is also especially useful for adding a new skein with kettle dyed yarns. When you use this technique you might find yourself having to work decreases or increases on WS rows. I researched this a bit to see if there was an easier way than I knew. Nope. In the photograph below the decreases labelled A and B are worked on the RS of the row. A is the CDD or Central Double Decrease. Notice that the center stitch is on top of the stitches to the right and left. This decrease is used most in lace, mitred work and V-neck bands. To work it on the RS, you slip the first two stitches to the right needle as if you were going to knit them together (never separately). You knit the next stitch, then you pass the two stitches over the stitch you just knit. It is a bit more complicated to work it on the WS. It is a four-step operation. First you slip the the first two stitches, one at a time, knitwise and return them to the left needle (this changes the stitch orientation in preparation for the next step). The second step is to insert the right needle into these two stitches from the back (as you would for an SSP decrease). The third step is to transfer these two stitches back to the left needle (note that this repositions the stitches). The final step is to purl the three stitches together. If you look at the decrease labeled as "C" it is identical to "A". The decreases labeled "B" and "D" are identical as well. 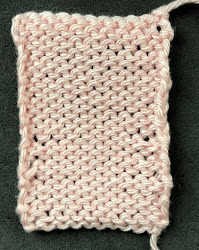 Notice that for these decreases, the center stitch is underneath the stitches to the right and left. This decrease is most often used in lace. To work it on the RS, slip the first stitch knitwise, knit the next two stitches together and then pass the slipped stitch over the two stitches just knit. To work it on the WS, purl the first two stitches together, slip the next stitch knitwise and return it to the left needle, return the stitch you created by purling the two stitches together to the left needle and pass the slipped stitch over that stitch. I won't be having salon this week since I'm going to the Met HD production of Luisa Miller on Saturday and Sunday is the photo shoot for Cast On. The project to go with the Learn Something New is a striped sweater I'm calling Fishing in France. It was a very quick knit. Here are photos of the dresses with close ups of the roses.